kitchen to cook for a Thanksgiving themed episode. A cranberry Quick Fire was announced leaving the star athletes with a stellar pantry and the others with sub par ingredients. This Quick Fire winner surprised me however, when Katie’s name was announced. In my previous post, I had ranked Katie as being one of the first ones to go home. Now, I still do not think she has what it takes to win it all, but hey a win under her belt is certainly a step in the right direction. Anyway, back to the challenge. For immunity, the chefs went back to the first Thanksgiving. It was complete (or rather, incomplete) with all the original ingredients and resources that were available during the first Thanksgiving. The chefs still managed to create original dishes that the judges seriously approved of, but there were some struggles along the way. All of the chefs seemed to have an issue with the amount of smoke the fires were producing, and the lack of counter space left Stacey literally plating oysters on the ground. (Perhaps giving it more of dirt flavor!?) Greg, who also insisted on cooking goose, (because what is Thanksgiving without a bird on the table!?) struggled to get the right cook on his meat, and fell short. 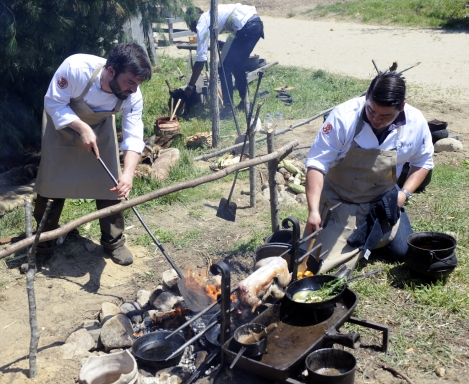 Still, the rest of the chefs provided a plethora of rustic dishes with the small amount of resources they were given. 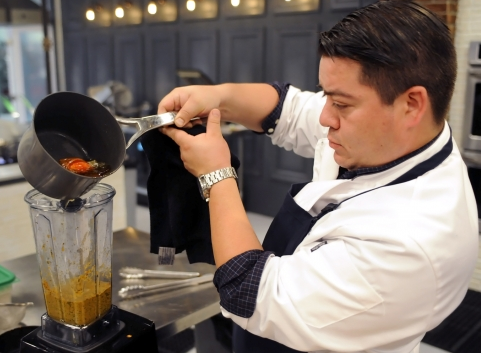 In a surprising turn of events, Katsuji took home the win with a roasted butternut squash dish with poached lobster. He took the win from the top three, joined by Mei and Doug (no surprises there). In the end, the hometown girl, Stacey, let the pressure get to her. 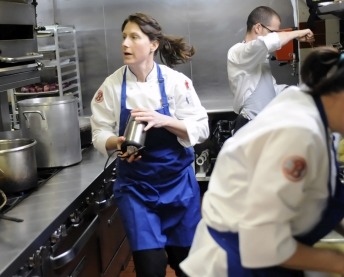 She was sent packing her knives leaving the rest of the chefs behind to form the Top 8. Now the Top 8 is where the contestants really start to show their true colors. 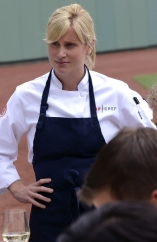 In the next few episodes, starting with Restaurant Wars, we will see who really wants that title of Top Chef! Let’s take a look at the new Top 3 and Bottom 3. Mei has been coasting at the top. Although she seems frustrated that she is always coming in second, it is not a bad place to be. Mei has crazy original ideas that wow the judges each time. I mean, who would think to cook cabbage in duck fat!? 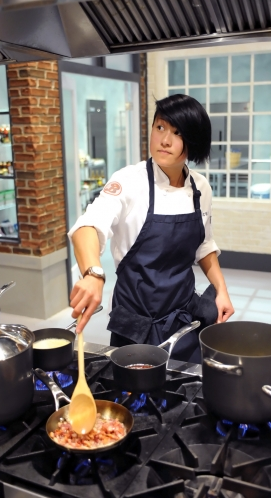 I bet that she will be in the final two, and will have the chance to become the Top Chef winner. Doug, also like Mei, has been hanging out around the winners circle. Doug is constantly cooking delicious food with original flavors. He takes sly risks, but stays true to his roots, making him a threat for the top. Who else would have the courage to roast A WHOLE rabbit in that short amount of time!? Doug seems like he is waiting to pull out his true colors and I would watch out for him in the next few episodes. Seeing Greg in the bottom three last night was like seeing a fish out of water. Everyone knows he does not belong there, but it goes to show that one mistake can send you home. Luckily, Greg was lucky enough that a dish that was worse than his. 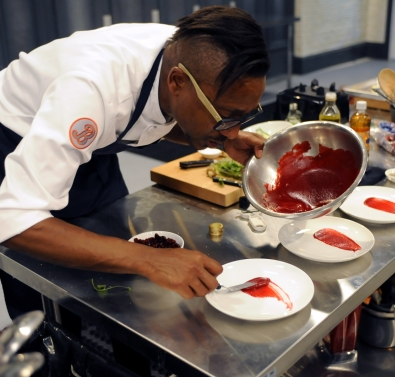 Still, Greg is not afraid to risk it all in the kitchen, which makes him top chef worthy. I would bet that his trip to the bottom three is not something that he will want to revisit, and will step it up from here on out. Keriann has been stuck in the middle for some time now. She barely got away last night, but she quickly turned her pie filling into a savory compote. I personally think that she has just been lucky. Now that her arch-enemy is gone (she was the happiest to see Aaron go!) it allows her mind to solely focus on the food. Still, she is pulling up short. If I had to make a predictions, she will get sent home during Restaurant Wars. Something about the pressure of that challenge and her attitude do not seem to be a good match. I thought for sure that Katie was going to be one of the first to go. I mean, who makes broccoli on their first challenge and last for more than two weeks. 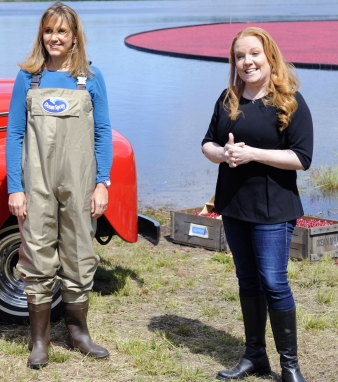 Katie has some tricks up her sleeves, but I don’t see her standing up to the rest of the contestants in the end. She is someone who could hold her own in last chance kitchen, however. I would count on Katie to go home soon, but I would not count her out for sure. Ugh, Melissa. I feel like she has so much potential, but does not cook up to her true talent. I mean, she cooks at a Michelin Star restaurant, but she roasted some vegetable (some undercooked, might I add) in the last challenge. I think she has the skills to make it to the end, but merely not the mind-set. Both of these chefs could easily fit into either category. I mean Katsuji has some tricks hidden somewhere and keeps pulling them out. I can see him going until the end, but I can also see him going overboard and being sent home. Same goes for Adam, he has simply been stuck in the middle, but Restaurant Wars may be his time to shine. I would not count out either of these chefs out. They might be the ones to keep an eye on in the next few weeks!